Located in northeast Hamilton County near the Georgia border, the entrance road for the Jennings Bluff Tract leads gradually down through upland hardwood forest to a trail along the slow, tannic Alapaha River. Other habitats include hydric hammock, scrubby flatwoods, sandhills and open field. Northern Bobwhite, Acadian Flycatcher, Yellow-throated Vireo, Hooded Warbler and Yellow-billed Cuckoo all breed here in summer. Migratory songbirds pepper the woods in spring and fall. Watch for Cooper’s Hawk, Wild Turkey and Gopher Tortoise; botanists will enjoy searching for Needle Palm and Atamasco Lily. Miles of administrative roads along the Alapaha River, Dead River and near the entrance road can be explored by foot, bicycle or horseback. 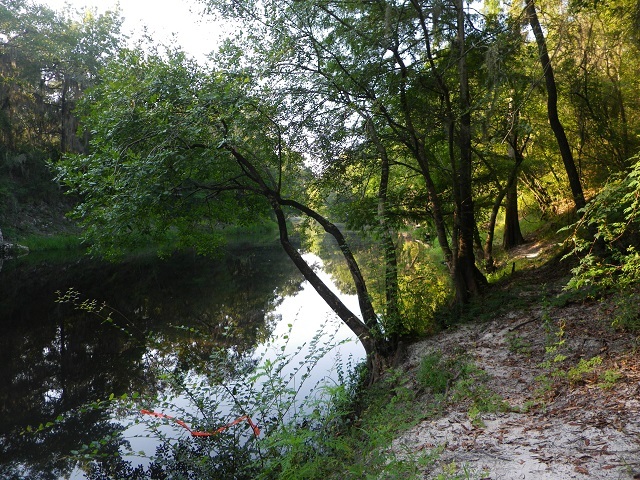 A canoe launch is available to paddle the Alapaha River.